DESCRIPTION Set elevated in grounds approaching 4.5 acres this detached Farm House offers some of the most extensive accommodation that we have seen in a long time. Yew Tree Farm, which dates back to the 17th Century, is positioned in the ever popular village of Northwick, just minutes from Bristol yet completely surrounded by some of the most beautiful countryside you will find in the region. The property, which isn't listed, has been renovated to a superb standard throughout and also boasts a wonderful Barn Conversion, swimming pool, rolling gardens and paddocks and yet still offers further potential if any new owner desires. The main Farmhouse is entered either at the front or to the side of the building. The side entrance is the more frequently used entrance and is made up of an oak framed structure which allows light to flood into some of the downstairs accommodation. The ground floor comprises a beautiful traditional kitchen which also allows space for a dining table, an adjoining sun room which offers an outlook over the side gardens, a wonderful sitting room with feature fireplace and gorgeous flag stone flooring, as well as a large separate dining room. 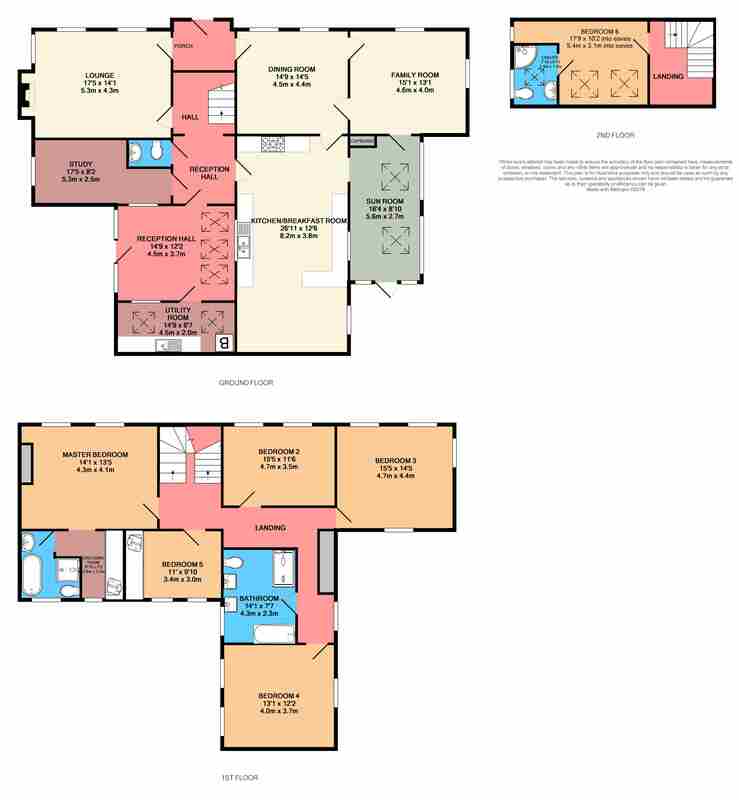 The ground floor is completed with a good sized family room and large study and a really useful separate utility room which is found just off of the aforementioned reception hall. The first floor is equally as good! Five very good sized bedrooms are all accessed from a twisting landing and each bedrooms enjoys its own unique outlook over the property's gardens and countryside beyond. The master bedroom is particularly impressive and of a very good-size; the bedroom also benefits from a beautiful ensuite bathroom and separate dressing room. Four further bedrooms are serviced by a beautiful four piece family bathroom. The final sixth bedroom in the main house is found on the second floor and is also of a good size, benefiting from its own ensuite shower room. There is also further potential to convert another sizeable barn, with current planning permission, which could create a further rental asset or even extra accommodation for growing families. During their 15 year ownership the current vendors have restored and renovated a former outbuilding into a superb detached barn conversion. The barn is deceptively spacious and boasts a large living area and modern fitted kitchen, a pristine shower room and large room which is currently used as a gym. There really are so many potential uses for the barn, space for guests and family, a home office or, with the relevant permission for change of use, a rental income. The gardens at Yew Tree Farm run to both the front, sides and rear of the main farmhouse. The gardens are mainly laid to lawn but also feature an array of mature flower and shrub borders. To one side of the property there is the added bonus of a heated swimming pool and raised decking area which is the perfect spot for entertaining and enjoying the surrounding views. And yet there is more! The property also benefits from a series of paddocks which offer the opportunity for keeping livestock at Yew Tree Farm, the land is well maintained and securely fenced as well. At the entrance to one of the paddocks there is a large detached hay barn which is perfect for storing both garden and agricultural equipment. The property is completed with a sweeping driveway, ample off street car parking for multiple vehicles and an open parking barn as well. SITUATION Northwick is situated in the parish of Chew Magna, in the northern part of the Mendip Hills, between Bristol and the Chew Valley Lake. The city of Bristol is only four miles away and Bath is twelve miles to the west. The village of Chew Magna was voted in 2011 top out of the twelve best villages in the UK in a survey featured in the Sunday Times. Surrounded by rolling hills, this Bath & North East Somerset village (www.chewmagna.org.uk) can trace its history back to Saxon times, and is popular with those who wish to escape from the city but have easy access to their place of work, being only 10 miles from Bristol, with its International Airport, mainline railway links and the M5 and M4 motorways. The picturesque countryside of the Mendips and the beautiful Chew Valley and Blagdon lakes are no more than a few miles away, and to the east is the Roman City of Bath, about a 30 minute drive away. The excellent local amenities include nearby schools, four pubs, bank, a supermarket, nursery and an area of shops including a post office and cafe. The area around is well known for its beauty, activities and attraction. The Chew Valley and Blagdon lakes provide a host of activities whilst the nearby Mendips are popular and boast great walking, riding and unspoilt nature.